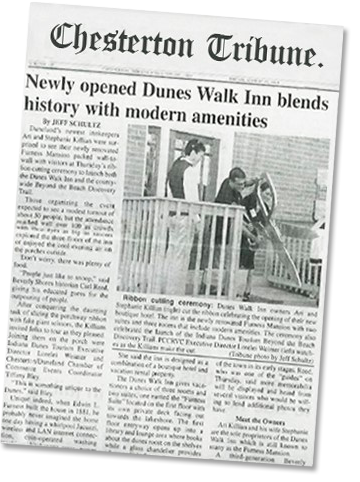 Duneland’s newest innkeepers Ari and Stephanie Killian were surprised to see their newly renovated Furness Mansion packed wall-to-wall with visitors at Thursday’s ribbon cutting ceremony to launch both the Dunes Walk Inn and the countywide Beyond the Beach Discovery Trail. Those organizing the event expected to see a modest turnout of about 50 people, but the attendance reached well over 100 as crowds with their eyes as big as saucers explored the three floors of the inn or enjoyed the cool evening air on the porches outside. Ari Killian and his wife Stephanie are the sole proprietors of the DunesWalk Inn which is still known to many as the Furness Mansion.